I am excited about this project. If you are not familiar with Arduino look here. But don't stop there. Search for projects, books, and hardware. You will find the Arduino system really brings microcontroller programming and hardware into the hands of people who do not have time to devote their lives to the minutia involved. Radio-SkyPipe is a computer based strip chart recorder. 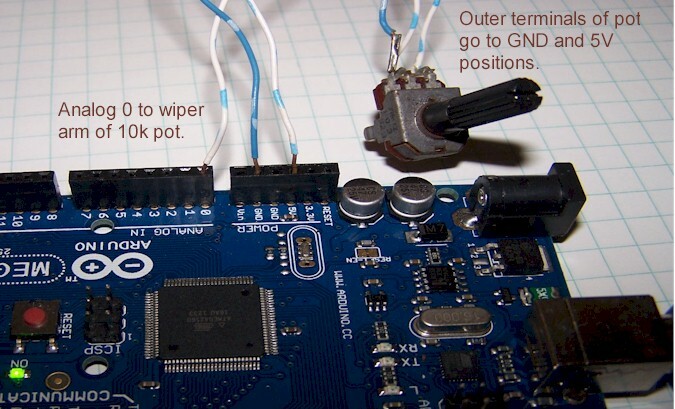 Arduino is blessed with generous analog inputs that may feed RSP with data. Weather stations, seismic monitors, solar controllers... its match made in hacker-heaven. (sorry) While I had been thinking about this for some time, I had not acted. M0ZJO did. Unlike Jonathan, I had never thought about putting the UDS code in the microcontroller and not in some intermediary PC program. I went to work on one possible Arduino program ( called a 'sketch' ) using the same Serial-TCP converter that Jonathan did. At some point I got frustrated with working through the converter program and light bulbed on the idea of just making a serial port connection directly between RSP and the Arduino. I would use the same protocol described in the UDS help page. Anyone experimenting with the RSP-Arduino combination should at least read that page if not study it a little. The Arduino sketch I created is shown here. It is meant as an easy, framework for handling the transmission of data from the microcontroller back to the PC. In this sketch, the Arduino serial port gets queried in the main loop of the program. The Arduino has a 64 byte serial receive buffer so it can easy handle the short commands it receives from RSP. To test the program I used a wiper arm of a 10 Kohm potentiometer attached to the Analog 0 input . The other two terminals connected across ground and +5V. Turning the pot varies the input voltage displayed on the chart. You get a two dimensional (voltage and time) Etch-a-Sketch. The inspiring doodle above was created with the Arduino-RSP setup described. 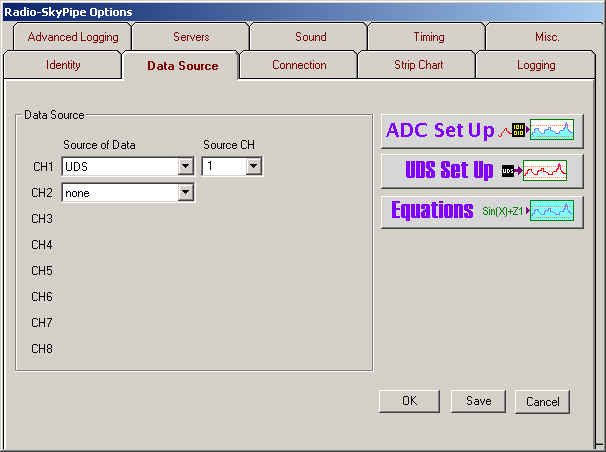 The panel above shows the simple configuration where the RSP chart will have one channel and derive its data from channel 1 of a UDS. 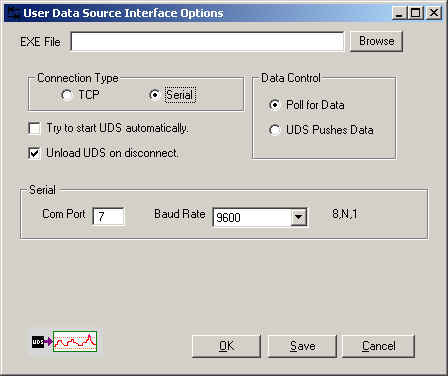 Click the UDS Setup button on this panel to configure the UDS connection. Beginning with RSP version 2.5.0 you may select between a Serial ( Com Port ) or the standard TCP connection type. The only real difference is how the data gets to RSP. The data formats are the same. We are connecting directly to an Arduino via its Serial port., so we must select the Com Port that the device is attached to on the computer. Select one of the available Baud Rates. We are fixed at 8 bit, No Parity, and one stop bit. In the case of the Serial connection type you should select Unload UDS on disconnect. This will send a KILL command to the serial device which can then used to reset back to its' state before the INIT command was received. In our case, we will not need to run an external program, so we leave the EXE File box blank.